So. Guess what I did on Saturday? Mass with Cardinal Dolan at the Basilica of the National Shrine of Mary, Help of Christians. Mass with Cardinal Dolan was amazing. For those of you who are not familiar with Cardinal Dolan’s time as bishop, he was first assigned to the Archdiocese of Milwaukee from 2002 to 2009. When he found out that he would be elevated to cardinal, he felt it appropriate to come back and visit the people of Milwaukee who helped shape him into the bishop he is today. 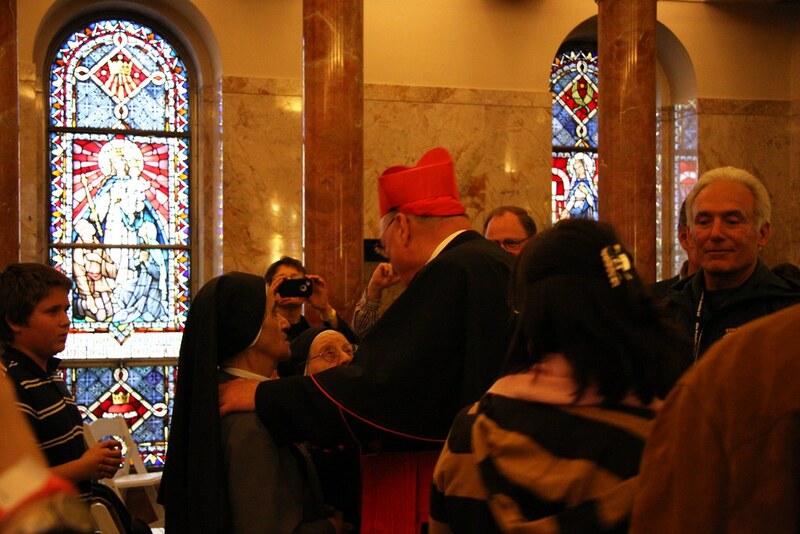 Cardinal Dolan’s love of Holy Hill is obviously deep, as so evidenced throughout his homily and time on the grounds. When we found out Cardinal Dolan would be just a stone’s throw away from Madison, my boyfriend and I knew we had to at least try to go. In the time leading up to this past weekend, we were getting a little discouraged by others. Although it would be fun, they said, they didn’t think it would be worth all the effort to go out there when you probably would just have to stare at a red speck at the altar, or even just on a TV. Well, that didn’t stop us! We got to Holy Hill around 12:45 or so the windy and rainy Saturday. A shuttle bus driver picked us up from the parking lot and drove us to the tent in the upper parking lot, where wristbands would be given out for the event. As we funneled into the tent, I was surprised it wasn’t full yet. This is likely a result of the miserable weather, and while I wish it had been nicer, I was thankful for the easy wait. We settled into row number 14, near by some sisters in their beautiful habits, a young man by himself, and an older couple. Since we were showing up around lunchtime, we broke out a little picnic of sorts to eat on our laps. They only had another 6 or so wristbands, so the first few people in my row were taken up to the church. For the next 15 minutes, we waited for the verdict: are there any extra seats in the church? We chatted with the young man immediately in front of us (who has lived on property near Holy Hill his whole life), and the three Schoenstatt sisters in front of him (they were the late arrivals from a larger group that was already in the church), speculating that with all the babies in front of us who also needed wristbands, there may be a few extra spots. 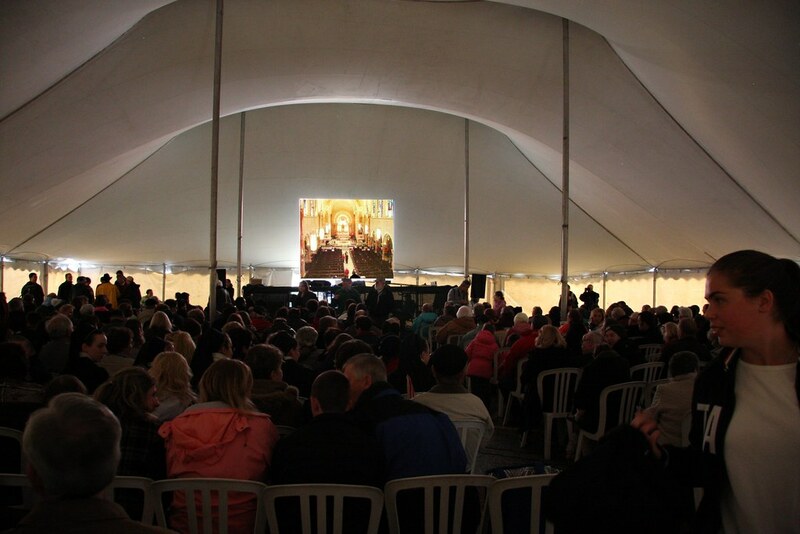 However, with the way the screen was set up, you could only see the front third or so of the church. This was the reserved section for the handicapped, hearing impaired, special guests, and the friars at Holy Hill. As a result, we had no good gauge as to whether there would be any extra room for us. Honestly, I was thinking that if we hadn’t taken the five minutes to stop for gas a few miles away from the church, or had we left just a little bit earlier, we would’ve made it. Finally, they announced that there would be 20 more wristbands distributed for the upper church, but we would be sitting in the Shrine of Our Lady, Help of Christians, just off of the sanctuary. My boyfriend and I didn’t spend much time pondering it – sounded good to us. The sisters and the man in front of us agreed, so off we ventured. They had no one guiding us, which made the trip an adventure, as our usual path – taking the outdoor stairs upwards – was closed due to the weather. As we made our way to the upper church, one of the sisters – Sister Jennifer, as I later learned – asked if we had met before, as I looked familiar. She was raised in Wisconsin and then transferred to the shrine in Nebraska recently, and I’m an Army child who had never visited Wisconsin until I decided to attend school there a few years ago, so we couldn’t find a connection. But after she said that, I had this feeling that I had seen her somewhere. My boyfriend felt the same thing, which made it all the stranger. With living in different places, we have very few people outside of undergrad who we share in our lives. It’s something I will need to ponder more. The church was packed fairly full. You can tell where the reserved section is by all the empty pews. Once we got into the shrine, we settled into the remaining seats. They had removed the usual chairs and set up several white ones facing forwards, towards the entrance of the shrine from the church. A TV and speaker was set up in front for us to watch Mass on, although we were actually not terribly far from the altar. We decided to sit next to the Schoenstatt sisters after a larger family needed the row we currently occupied. At this point, it was just after 2. Mass would start at 4:30, with the Rosary being held first at 4. 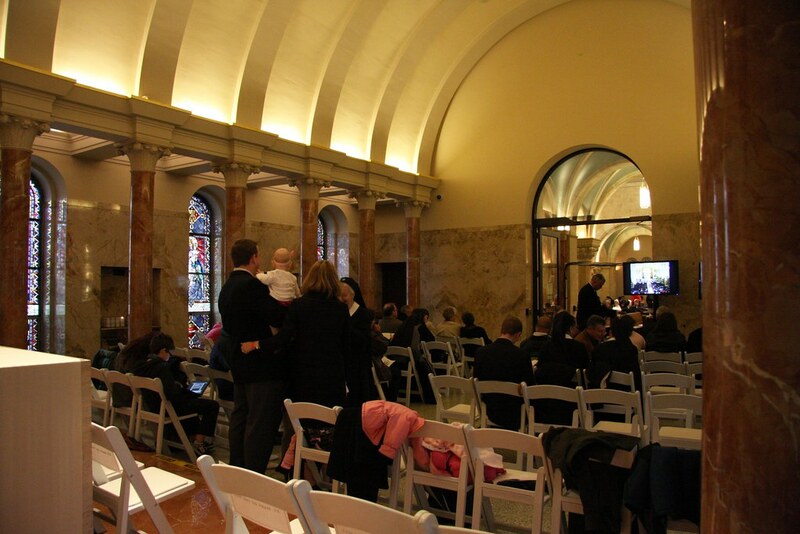 I spent some time snapping a few pictures of where we were and the multitude of people in the upper church. Navigating the church was a challenge, with so many people coming and going, trying to find their seats. My boyfriend and I then spent some time reading – The Catholic Controversy for him, apologetics for me (we were prepared for the wait). I eventually gave up reading – apologetics and the constant noise from everyone was not a good mix for me! Sister Jennifer (who I was seated next to) struck up a conversation with us, and so we talked about her community, her interests, our studies in graduate school, and a host of other details. Two of Sister Jennifer’s blood sisters are also a part of Schoenstatt. Additionally, Sister Jennifer will be making her final profession this upcoming year! Please pray for an increase of vocations for the Schoenstatt sisters – Sister Jennifer mentioned how much their services are wanted throughout the country, but how their group (while growing) cannot keep pace with the demand. Sister Jennifer was eventually went with the two other sisters with her to go visit the group in the sanctuary. As we were sitting there, watching the TV, we heard a murmur from the group in the church. Several camera flashes were going off on the left side. Sure enough, a small, red blob on the TV could be seen making its way across the front pews, greeting everyone. Yup, it was Cardinal Dolan. We stood at the entrance of the shrine for a moment, just to catch a glimpse. Eventually, they started rolling streaming footage on the TV, so we sat back down. Cardinal Dolan was a treasure to watch. His love of everyone was palpable. I figured he would make his way across the width of the church, then disappear down one of the side doors to get ready for Mass. But no, as I watched him, he wound his way around the the end up the pew and started up the side aisle. The shrine entrance is on the right side, so I was excited to catch a glimpse of him live as he walked by, thinking he must be trying to head to the back of the church. See the red hat below? 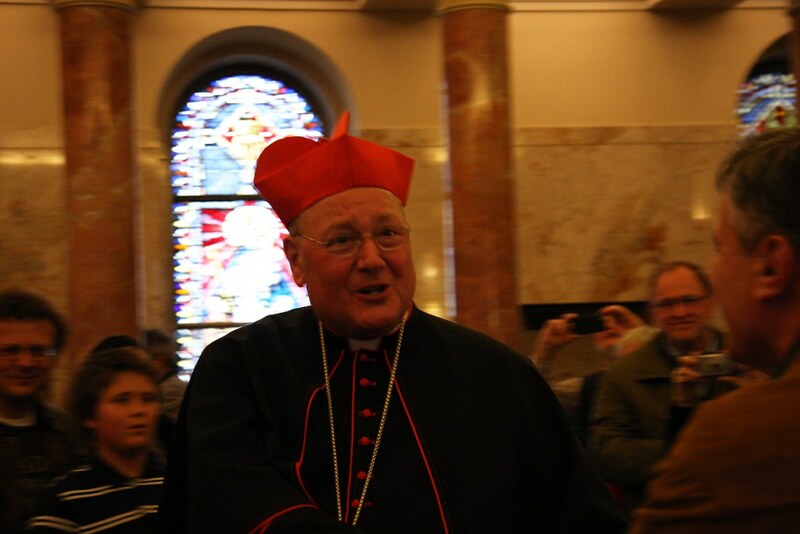 He surprised me again – when he got to the entrance, someone asked the people blocking it to sit down, and Cardinal Dolan came in to greet the 50 of us or so seated there! He mentioned that he hoped our seating arrangement would be agreeable for us, opining that we had the best seats in the house to be sitting in this beautiful room with our Blessed Mother, and then he started greeting everyone in the shrine. 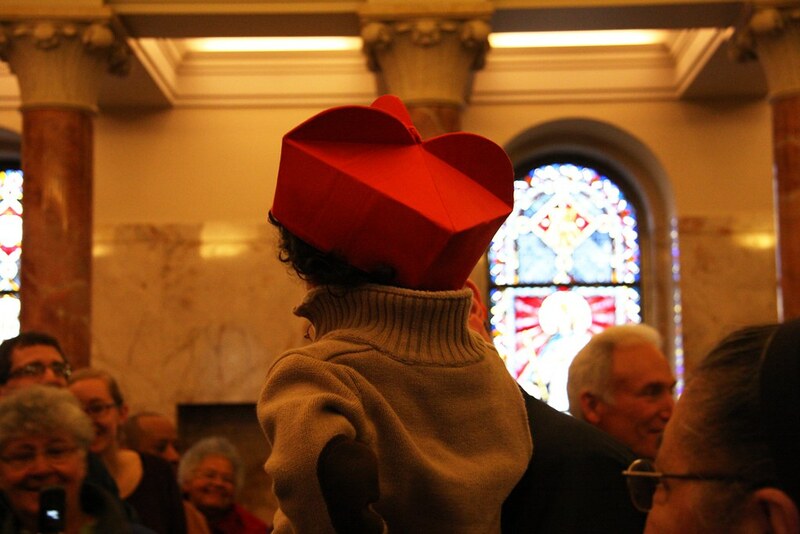 Don’t you just love this one of the little boy wearing the biretta? He was from the family sitting right behind us. I wish I had been standing on the other side to get a picture of his face! By the time he had made his way to the back of the shrine, I had wiggled into the aisle to get some pictures of him interacting with everyone. Eventually, Cardinal Dolan stopped and turned around. 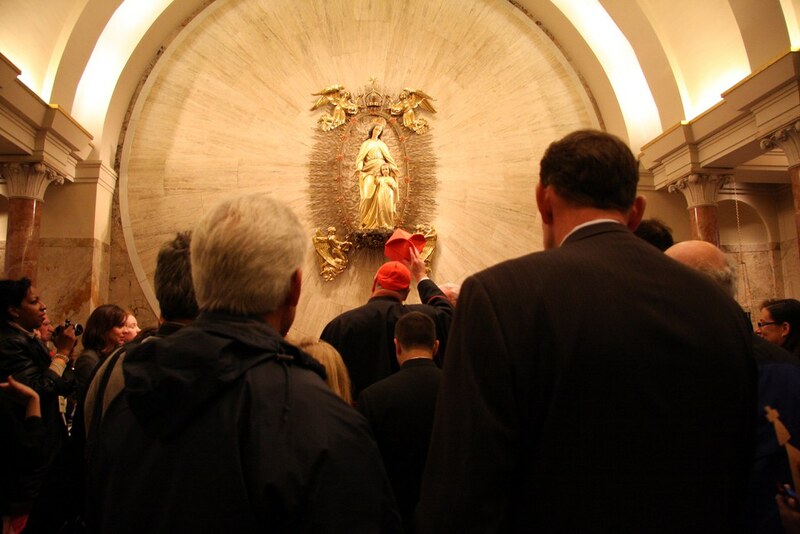 I can’t remember exactly what he said, but the gist of it was “Of course I am so glad to visit all of you, but I also came here to visit our Blessed Mother”. And with that, we all bowed our heads, he removed his biretta, and he lead us in the Hail Mary. 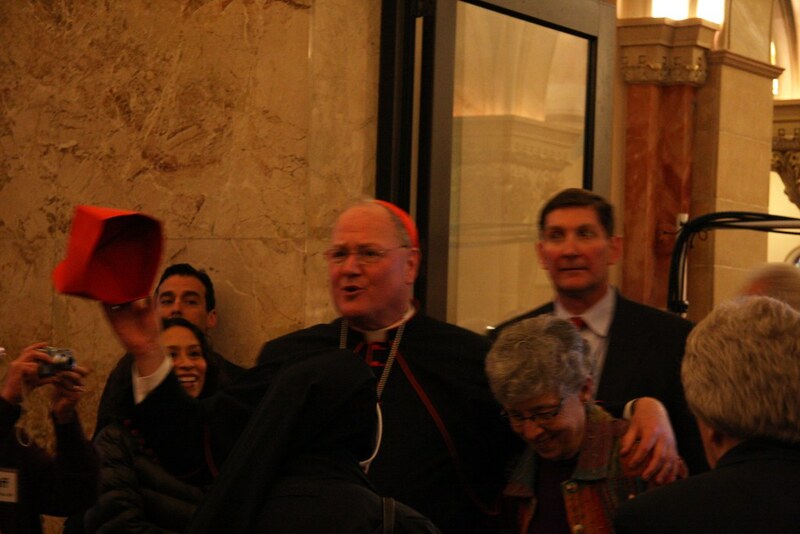 At the forefront of the above picture are two of the security guards tailing Cardinal Dolan. Just by the comments they were making, you could tell they were getting a bit antsy about how far off schedule they were in getting Cardinal Dolan prepared for Mass. 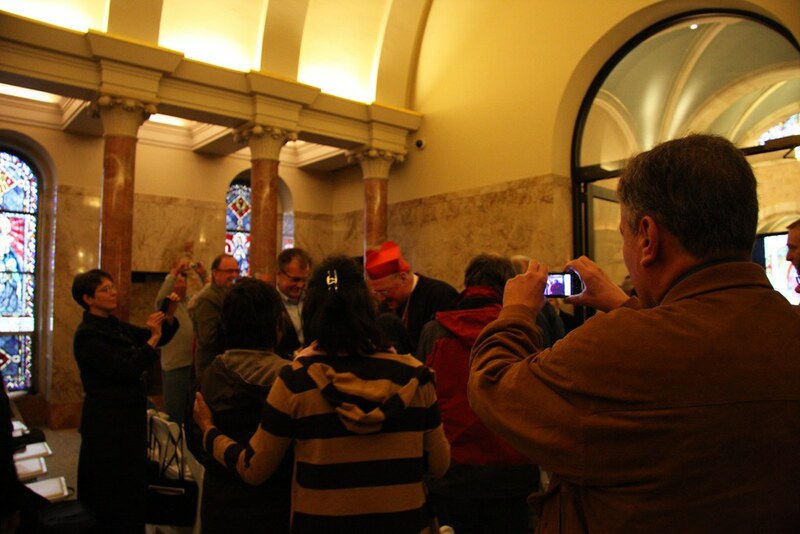 However, that did not deter the good Cardinal one bit – he kept going around and chatting with everyone! At some point during all this, one of the small boys sitting behind us had managed to grab our umbrella and was chewing pretty vicariously on the handle. No one in his family noticed he had swiped it for a while, although we were getting a kick out of this 1 year-old wielding a full size umbrella about. The Schoenstatt sisters, who had the chance to actually greet Cardinal Dolan, urged my boyfriend and I to just push forward and shake his hand after praying. Alas, we’re awkward, and he was greeting people on the other side of the aisle, so we settled for just being near him. After we had initially been seated in the shrine, my boyfriend suggested we would be about 100 feet away from Cardinal Dolan when he processed in down the center aisle, and we were thrilled about that. When he was in front of the shrine entrance, we were able to cut our estimate to less than 50 feet. But then we had the chance to see him up close – 3 feet. After explaining to the sisters that – being computer scientists – we can be the definition of awkward in social situations, we sat back down. About 10 minutes later, the rosary started. The rosary was wonderfully done. Holy Hill is run by Carmelites, so they had asked Carmelite sisters from five different convents to each write a meditation on one of the joyful mysteries. These convents corresponded to places that had been important in Cardinal Dolan’s life as a priest. The first mystery went to the sisters in St. Louis (where he was born, raised, and ordained), the second to the sisters in DC (where he served as the secretary to the Apostolic Nunciature), the third mystery to the sisters in Rome (where he served as rector of the Pontifical North American College), the fourth mystery to the sisters in Pewaukee, WI (for his seven years as Archbishop of the Diocese of Milwaukee), and the fifth mystery to the sisters in NYC (where he is currently Archbishop). Just before the rosary started, the three Schoenstatt sisters next to us were “upgraded” (as we were calling it) to the main sanctuary. Some space had been made amongst their many other sisters, so they went to join them. During the rosary, one of our original seating companions came back to let my boyfriend and I know that they had room for the two of us as well out there, if we wanted to move. We were content where we were, and thought we would see better on the TV anyway, so we politely declined. This turned out to be an excellent decision. Not long after we finished the rosary, Mass began. The procession was streaming from a side door to the right of the altar, up the right aisle (right past the shrine), and to the back of the church. We watched as the Knights of Columbus, a multitude of priests, and several bishops filed past. 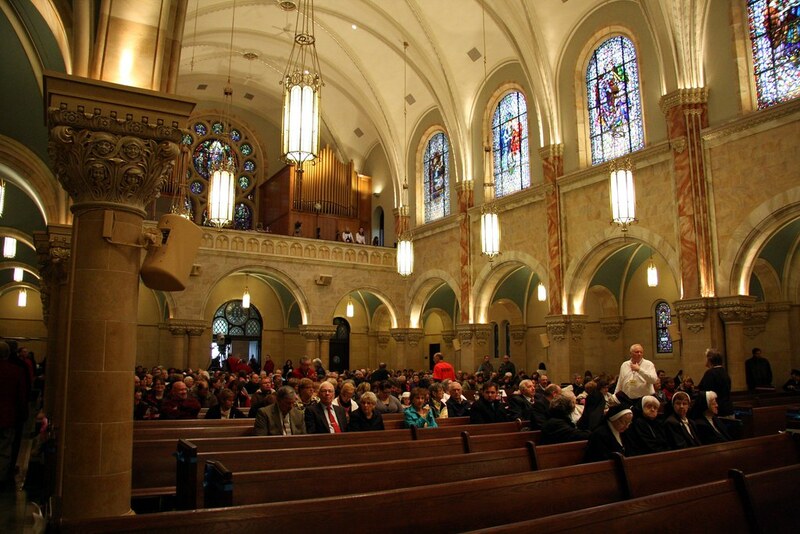 Bishops were present from the Dioceses of Milwaukee, Green Bay, and La Crosse – three of the five Wisconsin dioceses. I understand why the Bishop of Superior may not have been there (that’s the far, northwestern part of the state), but I was missing my own Bishop Morlino from Madison, right next door (he had other obligations). Finally, Cardinal Dolan walked by. He stopped at the entrance to the shrine, and I missed the beginning of what he said – all I caught was enthusiastic gesturing and “I need to be back in time for Mass on Sunday!”.Probably something about wanting to stay longer in the shrine. Whatever it was, it got a good laugh from those in the shrine. There isn’t much to say about most of Mass. Mass is Mass, after all. 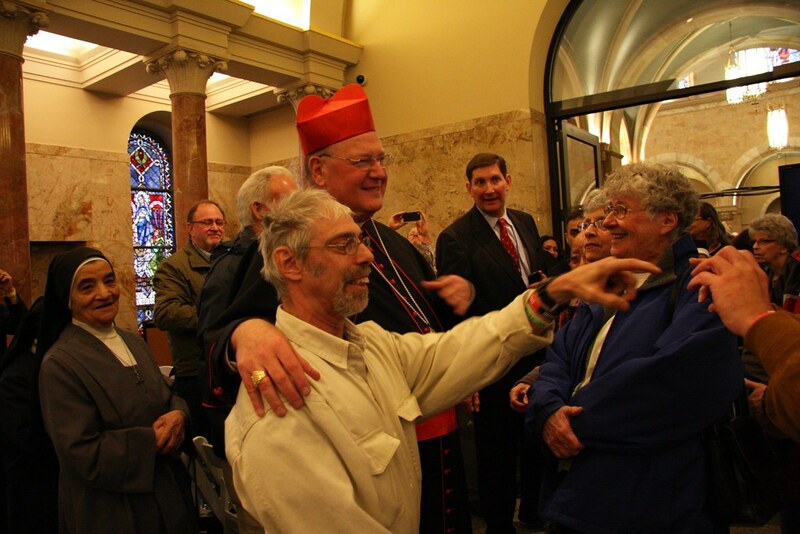 It was the Sunday of the Good Shepard – perhaps why Cardinal Dolan picked this day to celebrate his elevation to cardinal? The archbishop of Milwaukee (Archbishop Listecki) opened with some wonderful words about Cardinal Dolan, and how excited we all were for his homecoming, particularly since it was his efforts that elevated Holy Hill to a basilica. After the consecration of the hosts and wine, Cardinal Dolan took a ciborium and exited off the right side of the altar area. As we were watching on TV, I thought he was going to make his way to the front row of pews, but all of us in the shrine watched as he headed down the right aisle past the front section. The woman sitting next to me murmured “I wonder if he is coming here.” I remember audibly (but quietly) saying “no way” – I’m hoping no one heard that! And sure enough, we watched on the TV as he turned left out of the sanctuary and was in the shrine in front of us to distribute communion. Cardinal Dolan first distributed to the men and women sitting in the front rows of seats, as some of them would have had difficulty coming up for communion. Then we filed down the center aisle to receive. 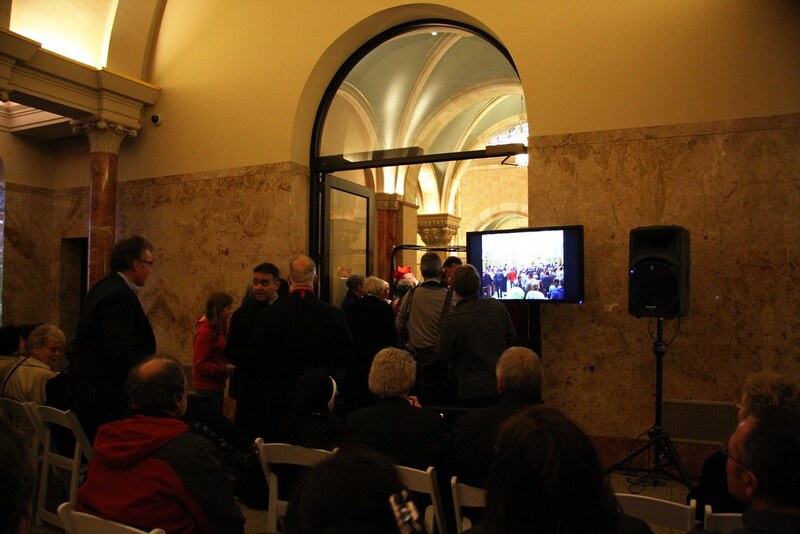 A second priest showed up to the left of Cardinal Dolan to help out, but the poor guy was somewhat rejected – some of the people on the left side of the shrine were jumping into Cardinal Dolan’s line, although the ushers eventually funneled people into the line of the second priest. 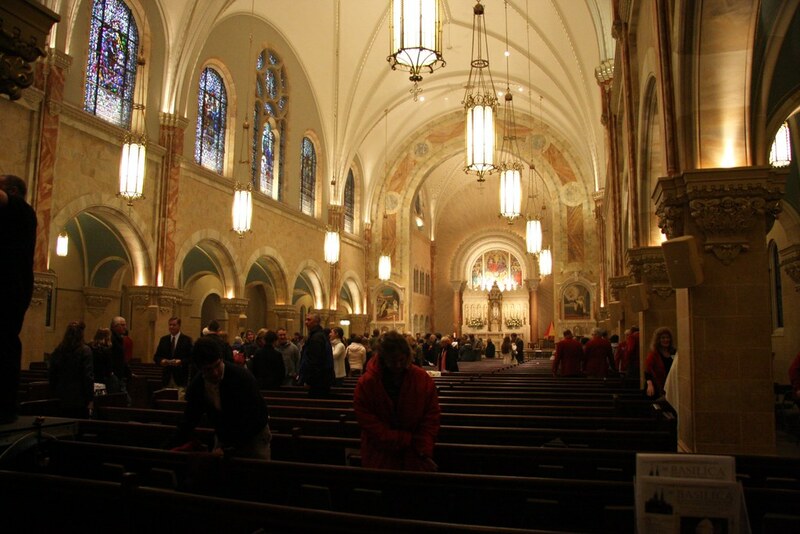 Luckily for us, we were on the right side, and were blessed enough to receive the Eucharist from Cardinal Dolan. I know they were recording footage of this part, and while I hope I didn’t end up on there, if I am, I probably look awestruck (the nice way of saying terrified), although I tried not to. 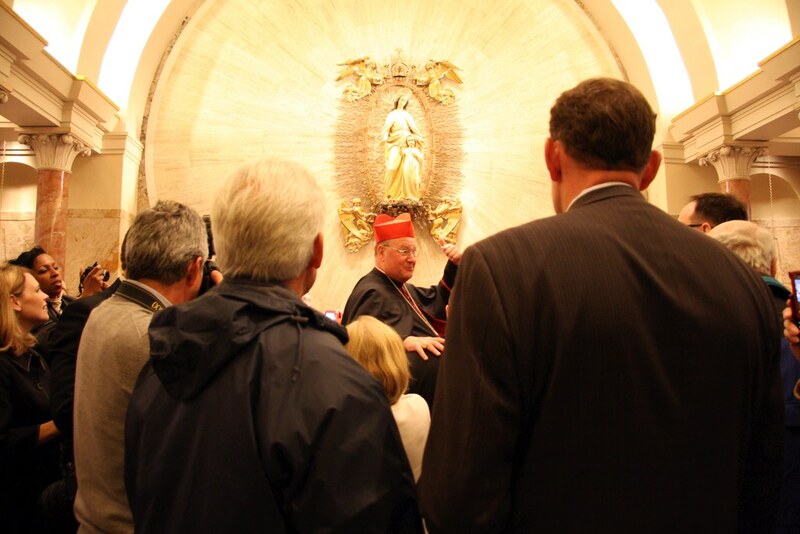 After Mass, Cardinal Dolan went to the lower church to see those in the overflow area. My boyfriend and I waited a few minutes for the crowd to thin out, and then started packing up our belongings. As we were doing so, a woman approached and asked if I was Allie. It turns out she was frequent commenter Darlene from Chicago! We had both been in the shrine for the entire Mass, which was a wonderful coincidence. Her husband was with her, who just entered the church this Easter. After hearing so much about them wanting to come visit Holy Hill, it was definitely surreal to get to meet them here – what are the odds? Governor Walker stuck around for a bit after Mass to greet people in the church (that’s the mass of people in the center of the above picture), so we tried to snap a few photographs of him. We also saw Rep. Ryan on our way to the shuttle, but my camera was already tucked away. Leaving wasn’t nearly as bad traffic-wise as I thought it may be. It turns out Darlene was parked only a few cars down from us, and we had a chance to wave bye to the Schoenstatt sisters we had originally been sitting next to. We had no problem leaving the grounds, and we ended up stopping for dinner at an Applebees, where we just sat there, going “Wow. I mean, Cardinal Dolan. Seriously. Awesome.” to each other. I’m sure everyone thought we were crazy. And that is it! A very long and busy day, but completely worth it. Wonderful post! And you thought you didn’t get any good pictures of the Cardinal. 😉 Here’s my own modest album, taken with my less-than-great iPhone: http://www.facebook.com/media/set/?set=a.10151004842197995.534466.724582994&type=3&l=be636365d0. We seem to have gotten a couple of the same shots from different angles. I’ll get back to you with some advice on church sightseeing in Chicago (I have to run at the moment). 🙂 I’m partial to the Polish cathedral style, but I won’t limit myself to that, though St. Hyacinth is clearly on the list. Thanks so much for sharing that album! You got a cute photo in there of the boy in the biretta. ^_~ It is neat to see the same photo from another perspective! 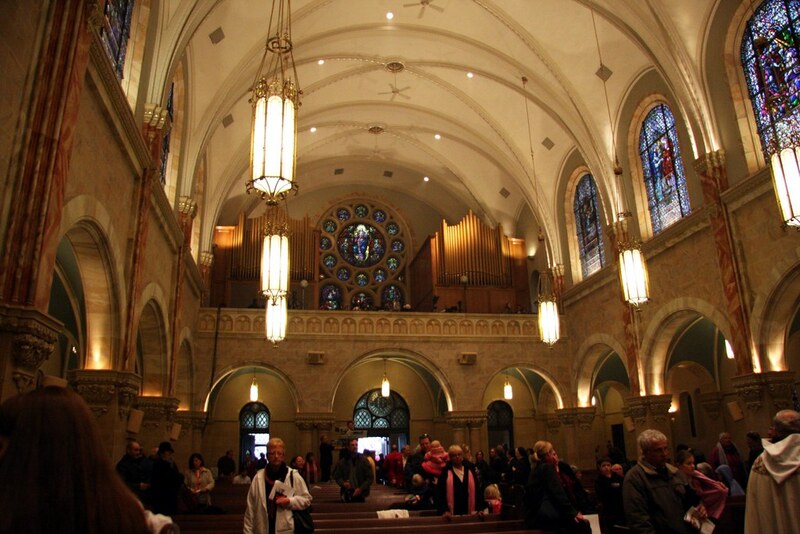 No rush on more Chicago churches – I think we’ve pretty much saturated May. But we’ll definitely add them to the list! Sorry, you said no rush and I proceeded to put off doing anything. However, next summer there’s going to be an awesome event at St. John’s. The church restoration should be done, as well as the installation of a historic restored organ, the Tina Mae, and there’s going to be an inaugural concert. (Info here, though warning that the videos are a little painful to watch: http://www.cantius.org/go/music/organ_fundraising_project/video) Hopefully, St. Stan’s will be done by then, too. Hopefully, if you contacted her, she’d be willing to answer questions or steer you in the right direction.